He became known for his influence in Rockabilly, which evolved as one of the earlier styles of rock and roll music. Its place in Memphis music history was created from a combination of country, blues, jazz, and rock and roll. It crossed cultures, generations, and nationalities to form its own unique genre in the early to middle 1950's. In 2011 Lee joined the cast of the Broadway hit musical Million Dollar Quartet, inspired by the legendary recording session that took place Tuesday, December 4, 1956, in the Sun Record Studios in Memphis, Tennessee. The session was an impromptu jam session among Elvis Presley, Jerry Lee Lewis, Carl Perkins, Johnny Cash and additional musicians. Rocker played the role of Carl Perkins' brother and bass player Jay Perkins. Rocker was a close friend and musical collaborator of Carl Perkins until his passing. At sixteen he bought an upright bass fiddle and started a band, practicing in his dad's garage. In the summer of 1980 the band moved to London and called themselves the "Stray Cats." He's played or recorded with the musical architects and pioneers of Rockabilly, including Carl Perkins, Scotty Moore, Wanda Jackson, Levon Helm, as well as George Harrison, Ringo Starr and others. Rockabilly evolved as one of the earlier styles of rock and roll music. Its place in Memphis music history was created from a combination of country, blues, jazz, and rock and roll. It crossed cultures, generations, and nationalities to form its own unique genre in the early to middle 1950s. 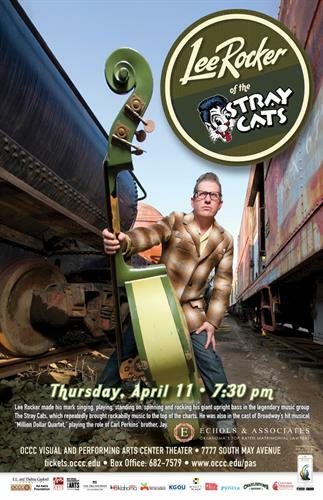 Stray Cats, the band that put Rockabilly music back on the record charts in the early '80s, scored several big hits on both sides of the Atlantic thanks to a striking visual 1950's style brought "up to date" with exaggerated pompadours and colorful tattoos, as well as genuine musical chops that evoked the best players of Rockabilly's original heyday. The music had a rhythm that was rock solid yet loose, the singer could croon or shout and the guitar playing demanded respect. It was elegant yet hard, jazzy yet completely rocking. Their music and style were like nothing happening in pop culture at that time. A one-off reunion show in California in 2003 created such a good vibe between the three guys that they decided to mount a month-long summer tour of Europe to celebrate both the Rockabilly trio’s 25 year career and the 50th birthday of rock and roll in the cities where it all started for them.